There are some recipes that only come out on special occasions. 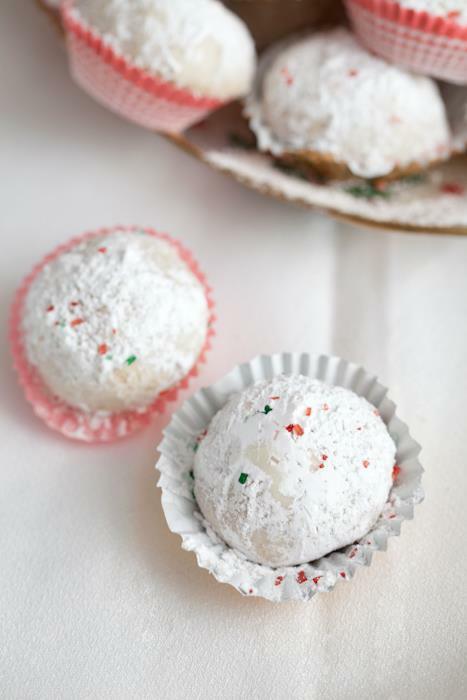 For one reason or another, they become known for “the ones you make at Christmas” or the “famous Easter cake.” These walnut butter balls only come out three times a year for me: Thanksgiving, Christmas and New Years. More than three times a year is not permitted! Not because they’re difficult to make, in fact, they are SUPER easy, but they are also very rich! They’re not called “butter balls” because they’re light! They only have a handful of ingredients, butter being one of the main ones. When baking, I tend to look for recipes that call for one stick of butter or less or the somewhat healthier olive oil. These call for two sticks and the recipe only yields about 36 to 40 cookies. They melt in your mouth, of course they would, with two sticks of butter, and are super addictive. It’s my “go out with a bang,” dessert at New Year’s Eve, before, you know, I swear off butter in January. That usually only lasts for a few weeks! The walnuts can just as easily be substituted with pecans. The overall flavor does change substantially, but both are equally as good. I suggest making one batch of each and then decide on your favorite. Walnuts are substantially cheaper. Since the ingredient list is pretty short, it’s recommended to use only high quality ingredients. I do that even when the list is long, it’s not worth cooking or baking if you’re going to skimp on the ingredients used! Make sure you get the best nuts you can find (I like Trader Joe’s) and pure vanilla extract only (I like King Arthur’s Flour brand). 1) Preheat oven at 350 degrees. Using a food processor, chop walnuts or pecans until they are very finely ground, until they almost resemble bread crumbs. 2) Using a stand or handheld mixer, blend butter, salt, powdered sugar and vanilla until fluffy. 4) With the mixer still on low, slowly add the 2 cups of flour until well blended. 5) Using a 1-inch scoop or a tablespoon, scoop cookies and roll between your hands. 6) Place on cookie sheets that have been lined with parchment paper and bake for 17 to 19 minutes, rotating the sheets halfway through baking.